One of the most critical pieces of data to long-range shooting beyond 400 yards is knowing the precise distance to the target. The Bushnell Fusion will range out well over 1,000 yards, yet is still quite affordable as such models go. In some cases, long-range shooters work from static positions, meaning situations in which they don’t intend to move much. If they do move at all, they’ll set up elaborate ranging systems such as military artillery-range equipment or very advanced compact commercial units. 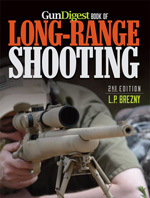 These shooters are in a separate class of long-range riflemen in which the goal is to send their bullet as far away as possible and still be successful at hitting a target. For these shooters, of course, the use of the gap ranging method or any other shorter-distance ranging system is out of the question. The name of their game is technology. 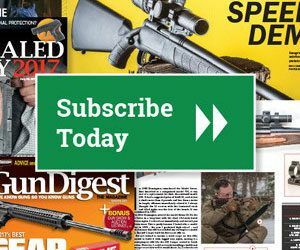 Today, there are rangefinding units that can integrate with the rifle scope and allow on-the-spot adjustments for 1,000-plus-yard targets simply by dialing them in, setting the elevation adjustment for drop compensation, and touching off the round. The Burris ranging scope discussed in the last chapter is an excellent example of this kind of technological advancement. With that scope, you have a tool that retains its own ranging functionality out to 800 yards and allows the shooter to dial in a target without any additional support equipment whatsoever. For the price conscious, Leupold is well worth a look. American-made, dependable, and accurate in the field just about says it all about Leupold. I use a lot of Leupold products, because they tend to get the job done without many of the common problems often encountered when hunting. Leupold’s compact RX line (Leupold currently offers six rangefinders in this line, including one for archers, with prices starting around $275), of digital rangefinders are a class act, though they do retain added features you may not need or want. Remember, the primary purpose of a rangefinder is to find out how far away something is. You probably don’t need your rangefinder to be half-yard accurate to 125 yards, since you should be able to range that distance without a mechanical rangefinder, but the RX units will do that for you nevertheless. You also might not have need for a variety of reticles, but you’ll get that, too. Only you know whether a feature is fluff or necessity. For instance, I still find that I basically bring my up rangefinder, read the range, and go back to my scope and its Mil Dots for any required elevation. On one of my many trips to Wyoming, to test optics and other equipment, I recently got to use a rangefinder with the ability to tell you how far the goods are out to 1,000 yards. The unique thing about this one is that it carries a price tag under $400; shop hard and you could find this unit selling around $275 and change, a price point more applicable to a unit with a 500 yard or less capability—well, maybe with most brands, but this is a Weaver rangefinder I’m talking about, and now that Weaver is under the control of ATK (Federal Ammunition), it’s stepped up its game and produced a very capable system. I used this 8x rangefinder over a full week and on hundreds of targets, without a single failure to return positive data. At 600 yards, this unit will record big game clearly. I tested it on antelope and mule deer, as well as cattle, to a solid 800 yards. The 1,000-yard maximum was verified by ranging larger reflective objects, including stock tanks, small ranch buildings, and rock piles. When it came to confirmation through shooting, the unit resulted in a bunch of longer range prairie dogs, gophers, and badgers meeting their maker with direct hits from a T/C .22-250, a 7.62×51 (.308 Win. ), and Hornady special high-performance long-range .223/5.56mm NATO rounds. One rangefinder that was used a great deal for this book was the Swarovski LG. This unit is very small, about the size of a pair of opera glasses, but it ranges to 1,500 yards and, at times and depending on the target, beyond. I found it quick to lock onto very long-range targets, requiring only a small subject like a rock, tree, or brush to produce a bounce-back laser reading. This unit is not a budget item—the lowest online price I found was $700, with most being closer to $900 and $1,000—but it is very dependable and it will take all the guesswork out of establishing a target’s range. Bushnell, another company well-known in this business, offers a complete line of ranging equipment. The most minimal device, the Sport 850, will run you just a bit under $300, but will get your range readings to 850 yards. On the other end of the spectrum is the newer Elite 1600, which will reach all the way out to a stunning 1,600 yards, though at a price of $850. Simmons Optics offers its laser rangefinder, the LRF 600, for just a smidge over $200, and, to be sure, these units get the job done. Nikon currently lists eight different units in prices ranging from as much as $480 to as little as $150. In terms of pricing I’m staying as close to my information sources as possible, but don’t hold any company to an exact figure. Do your shopping, especially via the Internet, using the information here as a general guide in selecting ranging equipment. In the ultra high-grade department, Leica sells the combination rangefinder and binocular Geovid HD-B for up to $3,000. I have used a similar model when hunting rockchucks in Idaho, during days when I couldn’t make out a thing with a cheap binocular. The ’chucks were exactly the color of the rock and, when sitting still, they were lost to the grainy formations surrounding them. The Geovid picked them out and also returned exact ranges well out to 800 and 1,000 yards. In my opinion, these are professional devices, tools designed for guides hosting high-end clients hunting sheep and other expensive trophy-class game, or military snipers requiring far more exact measurements to the target than you and I would normally use. Again, you need to think your application through before spending that kind of money on a ranging system. If there is any question after this abbreviated look at ranging units, it is probably one of inquiring whether we are becoming dependent on mechanical devices, versus a learned physical response to a ranging problem? In other words, is it equipment or practiced skills that make a good long-range shooter? It is easy to fall back on the toys and then forget what granddad taught us.